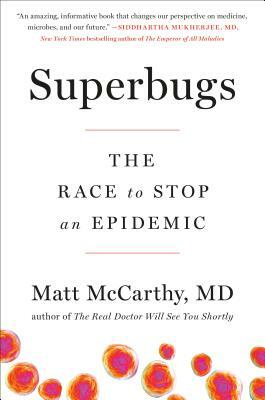 A New York Times bestselling author shares this exhilarating story of cutting-edge science and the race against the clock to find new treatments in the fight against the antibiotic-resistant bacteria known as superbugs. Physician, researcher, and ethics professor Matt McCarthy is on the front lines of a groundbreaking clinical trial testing a new antibiotic to fight lethal superbugs, bacteria that have built up resistance to the life-saving drugs in our rapidly dwindling arsenal. This trial serves as the backdrop for the compulsively readable Superbugs, and the results will impact nothing less than the future of humanity. MATT MCCARTHY is the author of two national bestsellers, The Real Doctor Will See You Shortly and Odd Man Out. He is an assistant professor of medicine at Weill Cornell and a staff physician at New York-Presbyterian Hospital, where he serves on the Ethics Committee. His work has appeared in Sports Illustrated, Slate, The New England Journal of Medicine, and Deadspin. He reviews nonfiction for USA Today and is editor-in-chief of Current Fungal Infection Reports.